Now you can buy WP Engine WordPress Hosting at 30% OFF on any hosting plan. On Annual Plans this is equivalent to 5 months of free hosting, so you pay for only 7 months in the year. This discount is applicable on first invoice only. Click on the link below to get our exclusive WP Engine Coupon Code. If you talk about Managed WordPress hosting, WP Engine comes across as the unquestionable leader. WPEngine is the first specialist WordPress hosting company and continually invests in top-notch technology and research to build hosting solutions that are fast, robust and scalable. To make WP Engine even better for you, we are offering an exclusive WPEngine coupon that entitles you to receive a full 30% discount on purchase of any hosting plan. You normally get 2-months free hosting when you sign up for an annual plan with them. 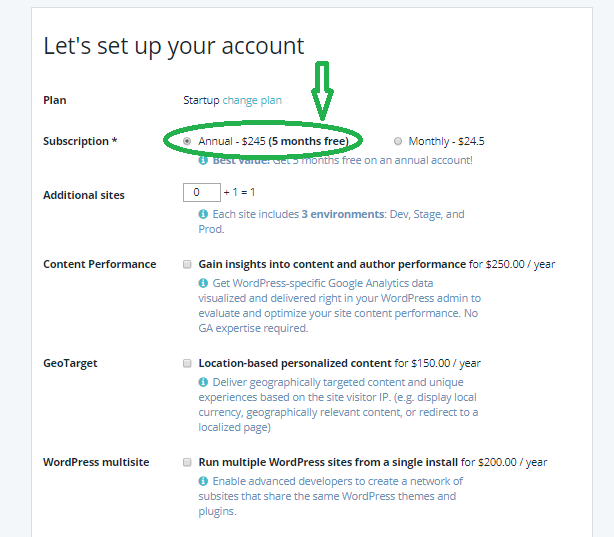 With WP Engine 30% OFF Promo code added to your account, you receive equivalent of full 5-months of free hosting on annual plans. Click on our WP Engine Coupon above to get access to the offer code. 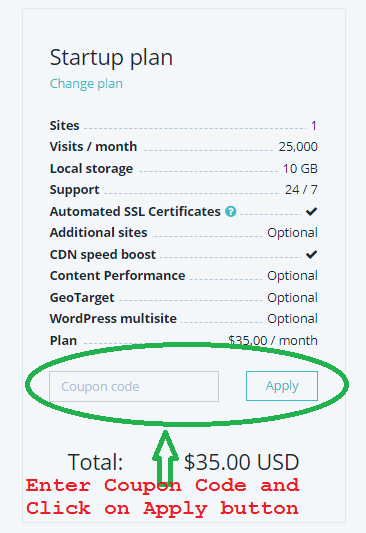 How to Use Our WPEngine Coupon Code? You can get full benefits of the WP Engine discount code when you choose annual billing cycle. Since our offer code gets you 30% OFF the first invoice, when you prepay for a year you save 5 months of hosting cost. This is applicable for any shared hosting plan – Startup, Growth or Scale. Follow the instructions below to claim maximum discount on WP Engine hosting. Click on the above WPEngine Promo link on this page. It will take you to their official website wpengine.com. (wpengine website will be opened in a new tab/page, so you can continue to reference these instructions as you go). Click on the “GET STARTED” button. On the next page click on the “PICK A PLAN” button. Or scroll the page down to see the web hosting plans available. It will lead you to a page with WPEngine hosting plans to choose from. The 3 available plans are StartUp, Growth and Scale. WP Engine can also customize a plan for you, if you think you need more resources and a dedicated environment. Once you have selected the plan you need, click on the “GET STARTED” button below that plan. Next you will be taken to account setup page. First make sure that you enter the WPEngine Coupon Code on the right hand side of the page. After entering the coupon code, ensure that the discount has been successfully applied and cost of the plan reduced. On the left side of the page, begin to set up your account. Here you will need to pick up the term of your plan. You can choose monthly billing or annual billing. It is suggested that you choose an annual plan to get the desired maximum discount of 5 free hosting months. Scroll below to enter your personal details and choose a data center where your website will be hosted. You should pick a location that is closest to your website visitors. 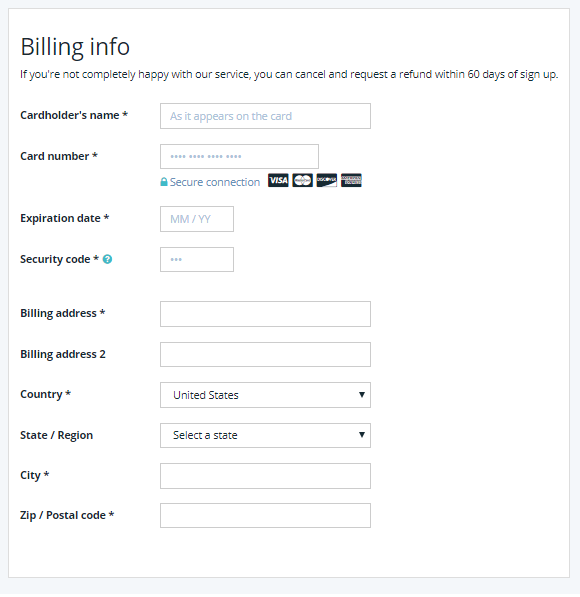 Then supply the billing details in the Billing Info section. After filling the account setup details, just check the Terms of Service box and click on the “Create my site” button at the bottom to complete your purchase of WP Engine hosting. What billing cycles does WPEngine offer? WPEngine offers both monthly and annual billing cycles. If you choose annual hosting plan, you are charged for only 10 months, so you receive 2 months free web hosting. What payments methods does WP Engine accept? You can pay using any Credit Card (Visa, MasterCard, American Express and Discover). WPEngine does not accept PayPal and customers have to pay using credit card. For premium customers or annual plan customers, company allows option to be invoiced and pay via check or by wire transfer. Does WPEngine offer multiple datacenters? Where are they located? Currently WPEngine has datacenters at following 7 locations – United States, Australia, Germany, Belgium, Taiwan, Canada and United Kingdom. How do I transfer my WordPress website from another host to WP Engine? Install the WP Engine Automated Migration Plugin on your existing website. This plugin is available in the wordpress repository. Enter the SFTP credentials generated in your WP Engine User portal into the options on the Site Migration plugin setup page. 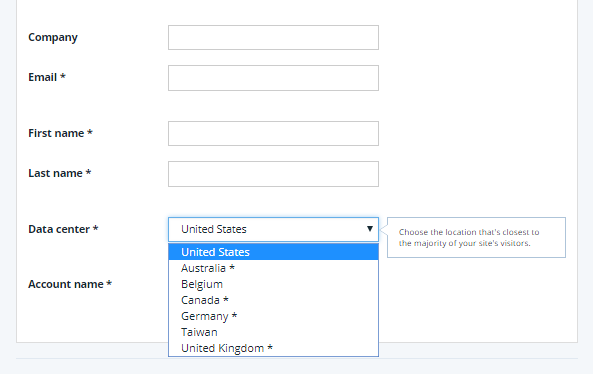 Select Migrate option on the plugin to initiate the migration to WP Engine. Plugin dashboard will show you the migration progress as it happens. Can I register my domain with WP Engine? WP Engine does not offer domain registration service. So, you will need to buy a domain name from another registrar for your website hosted at WP Engine. Can I buy SSL certificate for my website from WP Engine? WP Engine offers wildcard SSL certificates from RapidSSL. These RapidSSL certificates are available at a price of $199 and cover all subdomains. You can also install free Let’s Encrypt DV certificate on your website within WP Engine user portal. If you are a Growth or Scale plan customer, you also have the option to import a 3rd party SSL certificate in your WP Engine account. For most customers, free domain certificate available from Let’s Encrypt are good enough to secure their website and WPEngine encourages using them. Does WP Engine offer any Uptime Guarantee? WP Engine promises an uptime guarantee of 99.95%, excluding any excused downtime. In case the company fails to deliver on this guarantee, customers are given a credit of 5% of monthly fee for each hour of downtime. Does WP Engine have a money back guarantee? WP Engine plans come with a 60-day money back guarantee, which means that if you are unhappy with their services and cancel your account within the first 60 days of purchase, you will be refunded full subscription fee. One can cancel their subscription from within the wpengine user portal. Does WP Engine allow WordPress Multisite? Yes WP Engine allows you to create wordpress multisite websites. Multisite is included as a utility in the user portal for custom dedicated plans. 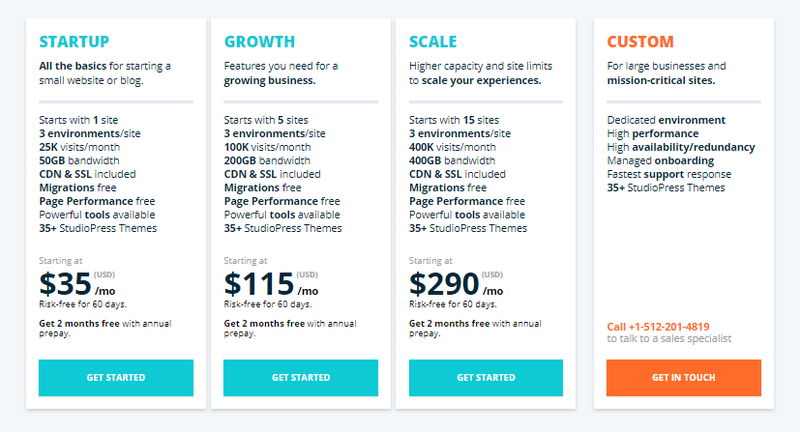 Startup, Growth and Scale plan customers can add multisite as an add-on. WP Engine imposes certain limits on the number of visitors that a website can receive per month in the pricing plan. These limits for an account vary with each plan. However, WP Engine does not suspend or cut off customers’ sites when this limit is breached and a spike in traffic is experienced on that site. Instead customers are charged a small overage cost for every 1000 visitors over the limit set in their plan. This is called overage pricing. Currently, existing customers are charged $1 for extra 1000 monthly visitors. All new customers of startup, growth and scale have to pay $2 per 1000 extra visitors. Do I have to upgrade my plan, if I need an additional website hosted on my account? WP Engine gives its customers flexibility to add sites to their current plan level by paying an extra cost of $20 per site per month. Will WP Engine backup my website automatically? WP Engine does automated daily backups of all customer websites. Last 40 of these daily backup points are accessible in the user portal, for any older backups one has to request the customer care. Customers can also manually create their backup points and revert to any backup point by simply choosing Restore option available in the user portal. There is also ability to restore the backup to a different install or environment. Does WP Engine offer unlimited storage on its hosting plans? No, WP Engine hosting plans do not include unlimited storage. It is set to 10GB for Startup Plan, going up to 20GB for Growth and 30GB for Scale plan. The custom plans can offer up to 1 TB of storage. Does WP Engine offer unlimited bandwidth on its hosting plans? No, WP Engine hosting plans do not offer unlimited bandwidth. It is restricted to 50GB per month for Startup plan. The higher tier plans Growth and Scale include 200GB and 400GB of bandwidth per month respectively. It can go up to over 5000GB for custom dedicated plans. What customer support options does WP Engine provide? WP Engine provides 24/7/365 support, which includes ticketing system and chat support. They have less than three-minute response time on chat. Phone support is also available but only on higher level Growth and Scale hosting plans. Does WP Engine offer a staging environment? WP Engine offers staging and development environments on all its hosting plans. A total of 3 environments are available for each website. Additionally, WPEngine has 1-click staging option that allows customers to copy live website from production to staging environment with a single click. To give WP Engine a risk-free try and get 30% OFF on any hosting plan use our special WP Engine Coupon Offer.